A lovely thing to do when you are staying in St Martin is to take a day trip to the beautiful and very close neighbouring island of St Barts. It is just 10 minutes away by plane and 45 minutes by boat. Great Bay Express is a brand new ferry operation established by Sir Bobby Velasquez, a famous figure in the islands yachting industry and owner of "Bobby's Marina ". There is also a high speed ferry named The Edge that comes to Gustavia once a day from Tuesday till Saturday. It leaves from Pelican Marina in Dutch St. Maarten at 9 AM. The passage lasts around 45 minutes. For Reservations and information call (+599) 544 26 40. And you can also charter a high-speed boat to come and pick you up in St Maarten. Contact: Marine Service or Master Ski Pilou, who offers a 24/7 St. Maarten water taxi service. Getting to St Barts by plane is very easy. St Barth Commuter operates several flights daily from both Saint Maarten Princess Juliana Airport and St Martin Grand Case Airport. You also have the option of chartering a private aircraft at any time of the day from either airport. 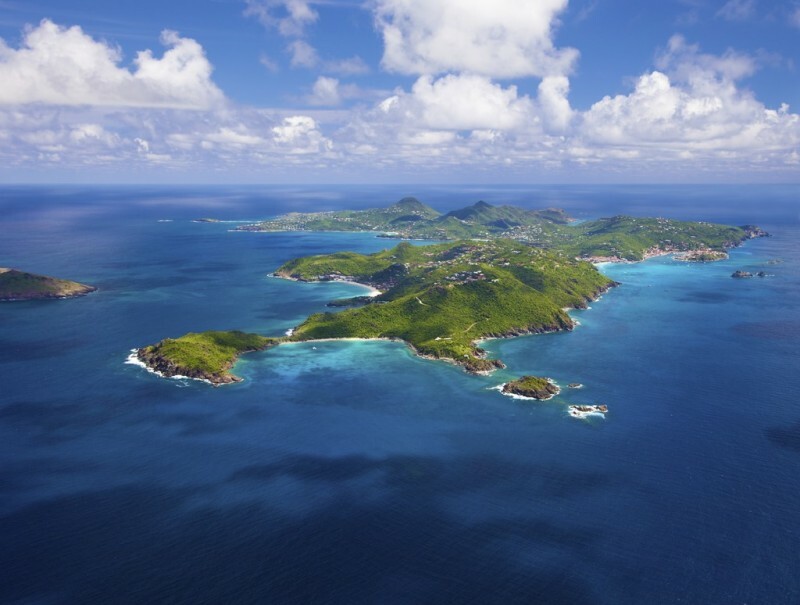 Either way, the flight takes about 10 minutes and when you arrive in St Barts, you will land and be through immigration and the airport in less than 5 minutes. The journey is beautiful. Because the flight is so short, the aircrafts fly low so the visibility is really excellent. The landing is exhilarating. It is worth travelling to St Barts just for that. The planes fly over a very steep hill and land on the second shortest commercial runway in the world. They stop just before they get to St Jean Beach – one of the most popular and beautiful on the island. The next question is what to do with just one day in St Barts? Rent an open-top mini cooper or small jeep and drive around the island. If you drive non-stop, then it will take you roughly an hour and a half to get around the whole island. It’s very small! But there are many beautiful beaches that are worth visiting on the way. The most popular is probably St Jean Beach located beside the airport and where you’ll find the famed Eden Rock Hotel and Nikki Beach Club. As you travel clockwise around the island, the next beach to stop is Grand Cul de Sac. It is quiet and much more remote then St Jean Beach but is naturally very beautiful. Then onto Saline Beach and Gouveneur Beach. They are both located on the West coast of the island so the waves are generally bigger but it is fully possible to take a swim on most days throughout the year. They are also both extremely beautiful. Shell beach is located in the capital of Gustavia and also well worth a visit. It is aptly named as it was formed from millions of crushed shells. For any fashionistas travelling to St Barts a spot of retail therapy is a must. The two main shopping areas are located in the capital of Gustavia and in St Jean which is by the airport. Gustavia offers a great selection of famous designer shops such as Louis Vuitton, Chanel, Dior, Cartier and Roberto Cavalli. But it does also have a great array of individual and very trendy boutiques. St Jean is smaller and has mainly unique boutiques. Each one is a virtual Aladdin’s cave of interesting items and fashionable clothes. Some of the main hotels also have fabulous boutiques. The two that come immediately to mind are located at the Isle de France and at the Eden Rock. A fashionable Lunch in St Barts is a must. The Cheval Blanc Isle de France is truly wonderful. The food is amazing and the location directly on Flamand’s beach is hard to beat. The hotel’s incredible boutique has a fashion show every day which adds to the atmosphere and glamour. Another firm favourite of ours is La Plage which is located at the Tom Beach Hotel on St Jean Beach. The food is divine and again they have a daily fashion show. This is where you will be able to buy the legendary Free in St Barts brand of clothing. If having the best views on the island is important to you then, Restaurant Sante Fe is the place to go. It is located on one of the highest points of St Barts and on a clear day, you will be able to see across to Nevis, St Kitts and Saba. The food is also wonderful. Lastly lunch at the Sand Bar restaurant located at the Eden Rock hotel is always amazing. You will experience great food and great atmosphere no matter what time of the year you visit the island. There are many great hikes in St Barth’s but with only one day, our favourite is the walk from Flamand’s Beach to Colombier Beach. It takes about 30 minutes. You walk along a rough path with incredible views firstly of Flamand’s Beach and then of the rocky cliffs to the right. You eventually come out at a truly pristine beach which is largely uninhabited apart from a few boats that come in for the day. The waters here are crystal clear and very calm. It is a truly beautiful spot. One word of advice is if you intend to spend more than an hour on the beach, it might be worth bringing some mobile shade from the sun. Our personal preference is to have a wonderful hike followed by a well deserved lunch at the Isle de France which just happens to be at the end of the trail.